ASTRA (ASsessment of TRAnsport Strategies) calculates changes in final energy consumption for different energy carriers relevant for the transport sector and the impacts on flexibility in the overall energy system today and in the future. It is an integrated assessment model applied for strategic policy assessment in the transport and energy field. ASTRA is complemented by the multi-country computer simulation model TE3 (Transport Energy, Economics, Environment) to consider the global automotive market when investigating the uptake of alternative car technology in Europe. Transport demand by mode and the stock of key fuel technologies per vehicle fleet are modelled with TE3 for main passenger car markets in Northern America and Asia and with ASTRA for Europe. ASTRA (ASsessment of TRAnsport Strategies) is an integrated assessment model applied since more than 10 years for strategic policy assessment in the transport and energy field. 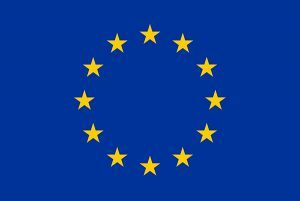 It covers EU27 Countries plus Norway and Switzerland, and integrates nine modules linked together in manifold ways: a vehicle fleet model, transport model, emission and accident models, population model, foreign trade and economic model with input-output tables, government, employment and investment models. The model is based on the System Dynamics approach and built in Vensim®; it runs until 2050 and provides sophisticated tools for sensitivity analyses. A key feature of ASTRA as an integrated assessment model is that the modules are linked together. Changes in one system are thus transmitted to other systems and can feed-back to the original source of variation. For instance, changes in the economic system immediately feed into changes of the transport behaviour and alter origins, destinations and volumes of European transport flows. 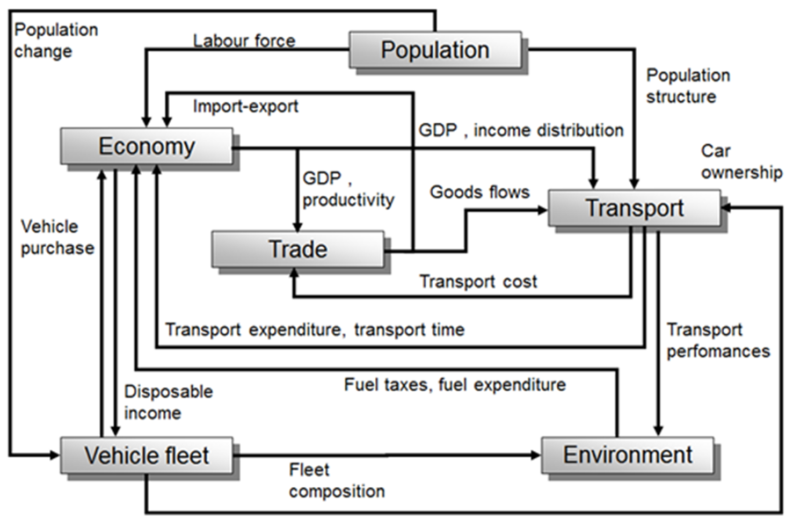 In turn, via some micro-macro bridges (see above), the changes in the transport system feed back into the economic system e.g. adapting the consumption behaviour of households or the sectoral inter-change of intermediate goods and services. Since all modules are part of the same dynamic structure, the whole model is simulated simultaneously. The most appealing consequence is that there is no need of iterations to align the results of the various modules. All parts of the model are always consistent to each other throughout the whole simulation. An overview on the modules and their main linkages is presented in the diagram above. The calculation of changes in final energy consumption for different energy carriers relevant for the transport sector and the impacts on flexibility in the overall energy system today and in the future is the main purpose of applying ASTRA in REFLEX. The model development foreseen in REFLEX will be based on the most recent version of ASTRA (ASTRA-EC). In order to simulate the final energy consumption for transport-related activities, the model needs to simulate first the requested technical transition of vehicle fleets for all transport modes from fossil fuels towards renewable energy carriers. The existing road vehicle fleet modules in ASTRA consist of a classical stock and flow model accounting the vehicle stock per age, emission standard and fuel technology. New registrations are driven by demographic development, by change of income, change of fuel and of car prices. The approach for simulating the diffusion of alternative fuel vehicles is driven by a derived calculation of total cost of ownership and the simulation of the impact of filling station network density in combination with average ranges of vehicles depending on the type of fuel. Depending on the mode, ASTRA will consider the key alternative fuel technologies that are feasible according to the characteristics. More simplified modelling approaches exist for the other road modes (passenger cars, busses, light duty vehicles and heavy duty vehicles). Non-road modes are not represented so far via stock models, such that the technical development for these modes is only reflected via changing CO2 and air pollutant emission factors over time. The basic idea for REFLEX is the integration of one-factor learning curves to simulate the evolution of vehicle prices, differentiated by major components of a vehicle (engine, chassis, electrical supply and demand, etc.) over time. Furthermore, the road fleet models need to be updated in order to represent the most recent development of alternative fuel technologies. While the current ASTRA-EC model considers for passenger cars already a wide range of alternative drives, the implementation of diffusion of alternative fuel technologies for busses, light duty vehicles and heavy duty vehicle together with one-factor learning curves is part of the planned extension of the model. The second major step for assessing the impacts of the transition towards renewable energy carriers for transport is developed by linking the changing costs per vehicle-km driving the transport performance in the transport model. Transport cost changes are supposed to influence in the state-of-the-art four stage transport model applied in ASTRA the distribution of trips and freight volumes but also the modal shift. Especially the shift towards electrified road transport bears some changes in the behaviour of users which needs to be elaborated on in REFLEX. Finally, the resulting transport performance in terms of vehicle-km per mode needs to be split into the set of existing fuel technologies with reasonable assumption of average annual mileages. This is then the baseline for the assessment of direct (tank-to-wheel) and indirect (well-to-wheel) GHG emission, air pollutant emissions (NOx, CO, VOC and PM2.5) per mode and per fuel technology as well as the measurement of final energy consumption per energy carrier. Braungardt S., Eichhammer W., Elsland R., Fleiter T., Klobasa M., Krail M., Pfluger B., Reuter M., Schlomann B., Sensfuss F., Tariq S., Kranzl L., Dovidio S., Gentili P. (2014): “Study evaluating the current energy efficiency policy framework in the EU and providing orientation on policy options for realising the cost-effective energy efficiency/ saving potential until 2020 and beyond”. Final Report of study on behalf of DG ENER. Karlsruhe, Germany. Krail M., Schade W. (2014): “Measures to promote the diffusion of alternative fuel vehicles in EU27”. Proceedings of the 5th Transport Research Arena (TRA), Paris, France. Schade W., Krail M. (2014): “GHG Mitigation Strategy in the European Transport Sector”. Proceedings of the 5th Transport Research Arena (TRA), Paris, France. Kühn A., Krail M (2013): “Dynamic demand modelling of freight fleets”. Proceedings oft he 31st International conference of the System Dynamics Society 2013, Cambridge MA, USA. ISBN 978-1-935056-12-06. Krail M, Schade W (2012): “Reducing the Climate Impact of Transport – Technologies and Policies for Road Transport”. Proceedings of the 30th International Conference of the System Dynamics Society, St. Gallen, Schweiz. ISBN 978-1-935056-09-6. Schade W, Akkermans L, Fiorello D, Jopson A, Köhler J, Krail M, Moizo A, Schade B, Shepherd S, Sievers L, Tercero L, vanHerle K, Weiss C, Wiesenthal T (2011): “Bottom-up quantifications of selected measures to reduce GHG emissions of transport for the time horizons 2020 and 2050: Cost assessment of GHG mitigation measures of transport”. Deliverable D3.1 of GHG-TransPoRD (Reducing greenhouse-gas emissions of transport beyond 2020: linking R&D, transport policies and reduction targets). Project co-founded by European Commission 7th RTD Programme. Fraunhofer-ISI, Karlsruhe, Germany. Kühn A, Krail M (2011): “The Potential of Alternative Fuel Technologies and of Efficiency Technologies for Heavy Goods Vehicles”. Paper presented at 12th International Symposium on Heavy Vehicle Transport Technology HVTT12, Stockholm, Sweden.